A new page was added to the the Discography today. It’s dedicated to the original RCA pre-recorded 2-track stereo open reel tapes. At least 50 79 such tapes were released (If there are more, please let us know!). Check out the 2-Track Stereo Tapes page now! Thanks to Chris Hite of Clarion Records for the photos, and thanks to Michael Kaplan and the ReelToReel Yahoo Group for the list. P.S. Although the early Munch/BSO Symphonie Fantastique wasn’t released by RCA as part of the original Living Stereo LPs, they did release it on 2-track stereo tape shortly after it was recorded in the ’50s (see it here). At a retail price of $18.95 — roughly $150 in today’s dollars — there probably weren’t a whole lot sold! The catalog numbers go to 247, but not all numbers were used. The C.J. King 2-track list (which can be found on Yahoo’s reel to reel group) lists around 225 releases, including two dealer demos. I am lucky enough to have several of these tapes, and they all sound fantastic, even after almost sixty years. I prefer them all to the vinyl counterparts, where I own both. The list also indicates that a great many of these tapes had no LSC counterparts, not just Fantastique. I guess I should clarify that a great many of the tapes released were popular, not classical. Don’t know if such are beyond the scope of this website. Still, there were quite a few more than fifty classical releases. The 2-track stereo tapes page in the discography is now as complete as possible based on current information. Thanks again to everyone for the help! Exciting to hear from so many people who think it’s useful. Credit for the list should go to Charles King and a number of audiophiles who worked on it for several years. The RCA tapes, of course, were listed in their own catalog inserts found in each tape box. It should be noted that most of the 2-track tapes were issued between 1954-1958 before the advent of the stereo record i(in late 1958). Some of the recordings were never released in stereo until their later issue on Victrola. Huge thanks to the folks who created the 2-track tapes list on the reeltoreel group. A fantastic resource! Just came across this post today. I am fortunate to have the vast majority of these RCA 2-track tapes, classical and popular. Their sound is indeed wonderful. 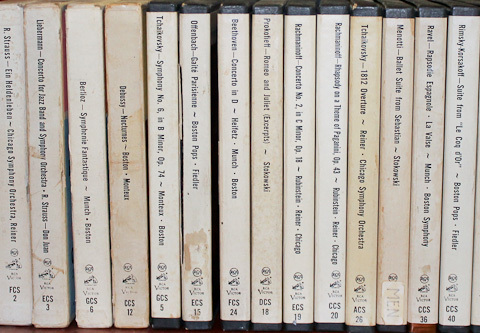 Many of the earliest tapes have 2 or 3 different cover-art versions, even though their issue lifetime was short. Many of the RCAs you have posted pictures for were issued in at least two versions. The earlier one usually has a box or two with large type describing the tape. The later one usually has a picture similar to the one on the LP album cover, although not necessarily so. You might want to include at least the two main versions where they are common. Great post, Bob. Thanks for sharing. Our plan is to post pics of both the early and late versions — whatever we can get our hands on. We have a big update to the tape photos coming up this month. Stay tuned! Great. You might also want to note that a lot of the early plain cover tapes did not have a label on them. I am not sure how many people know this. Also, there is a pretty good chance that if the tape was not played, the original leader is still on the tape. The original 2-track tape list was prepared by Charles King. I purchased it through an ad in a record collector magazine. King later placed it on the Yahoo reel to reel group to download for free. I helped Charles with adding to the list for years and now do the updating. There will be an updated version in 2015. New titles come slower now. The early RCA tapes came in a thicker box with a cardboard insert, leaflet, and a printed paper leader. The cover was generic with only the title and colors changing. This changed around #20 to a thinner box with a black edge with notes on the back and no leader. The earlier issues were changed. There were three dealer tapes with only the first being classical. The King list shows the LP equivalent. So are these tapes “Living Stereo”? The tape boxes do not say so. Yes, the RCA 2-track stereo tapes are Living Stereo – they are the same recordings as the LSC series. The tape boxes are printed with the text ‘RCA Victor “ORTHOPHONIC” HIGH FIDELITY RECORDING STEREOPHONIC’. Most early no-picture box RCA 2-track tapes are on unlabeled plastic reels with the RCA lighting bolt logo and the HMV nipper logo molded into the clear plastic. My very early ECS1 is on a plastic Soundcraft reel with a paper tab printed with the text ‘PRE-RECORDED BY High Speed Tape Duplicating Co., San Francisco’ and it is definitely a real RCA tape, not a dupe of some sort. Later tapes in the series had red and white RCA paper labels glued to the plastic reel that read, ‘RCA Victor PRE-RECORDED TAPE Stereo Orthophonic. If anyone is interested in collecting these, I will be listing 36 RCA 2-track tapes for sale on U.S. Audiomart next week (starting Monday or Tuesday, 29th or 30th of January, 2018). I have posted a list – including 15 rare EMI HMV and Columbia 2-tracks – on the Yahoo reeltoreel forum.